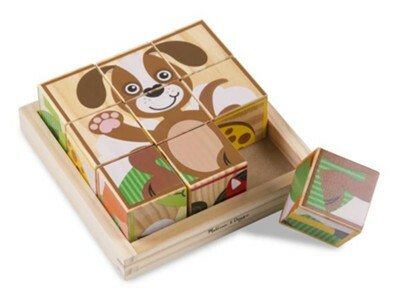 Encourage early learning with the My First Wooden Cube Puzzle from Melissa & Doug. Designed for ages 3 years and older, this adorable wooden cubed puzzle features 9 blocks that can be rotated and flipped to complete six cute animal puzzles. Featuring colorful artwork and easy to grasp cubes that encourage children to discover pictures of an alligator, horse, giraffe, cat, dog, and cow. Measures 8" x 8" x 2.25". I'm the author/artist and I want to review Animals, My First Wooden Cube Puzzle.